Polished grommets punctuate this trend-right See by Chloe silhouette that can be worn a number of ways. Cheek pink leather crossbody and convertible belt bag with grommet detailing. Magnetic front closure and interior card slots. 22" adjustable strap. 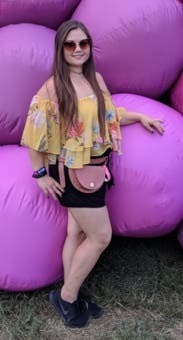 5"H x 8.25"L x 1.5"D.
The fanny pack was not that great so I wore it as a purse. The belt hangs a lot and wrapping it around gets awkward. Also downside was that My iPhone plus wouldn't even fit. Loved wearing this as a belt bag. Works best with jeans or anything that has belt loops, otherwise the strap is too long and just dangles. Fits phone and a few credit cards. I ended up only wearing this as a belt bag, but it would definitely be cute as a shoulder bag. At first, I thought it was way too small and would never work, BUT I found that there is a open pocket space, if you will, behind the flap of the main compartment. That made all the difference between keeping it or not. Although I couldn't put my phone fully in there, I was able to tuck it in so it wouldn't fall out but was very easy to reach. Perfect for the music festival I used it for. A word of warning, it was not easy to make it work as a belt without having 4 feet of belt just hanging down. 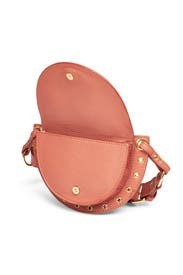 From the pictures of this bag, I assumed it was a fanny pack. When it arrived there was no way to turn it into one, so I tucked the extra strap down my pants lol. It's kind of an awkward shape and it's EXTREMELY small inside. Barely fit my phone in it. This was a great cross body bag for everyday and special events. I originally ordered it to wear as a belt bag, but never could figure out how to do that, which was disappointing (I emailed RTR customer support and they weren't sure how to wear it as a belt bag either!). The strap was way too long and there was no intuitive way to tuck it in when I put it around my waist. I ended up wearing it as a crossbody mostly and loved it for that reason, kept it for two months. Might have to buy this! 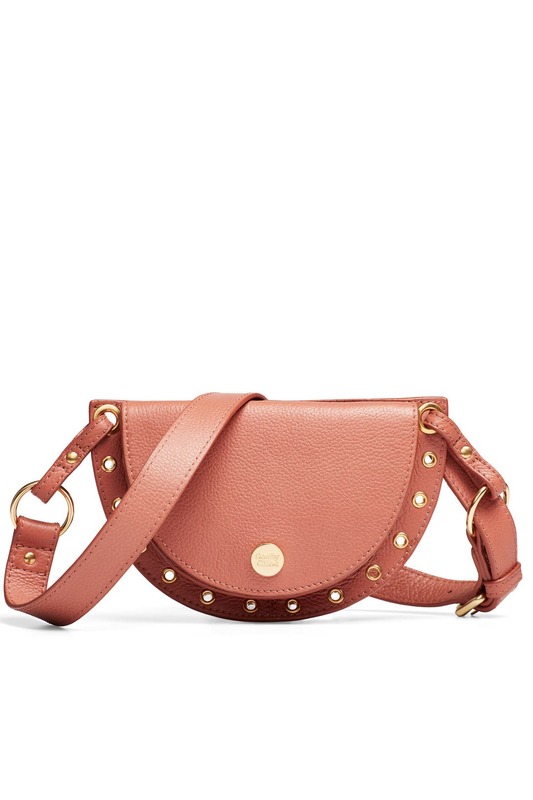 Perfect belt bag - tons of holes in the belt so you can wear crossbody or as a belt. Love this for going out! the belt strap is way too long. it hangs super long and there's no where to conceal it. I rented this specifically to wear out for a night of dancing with the girls. As others have mentioned, it's very small and has a lot of "extra" leather from the strap if you wear it as a waist pack. I have an iPhone X and couldn't fit it in the pack with everything else. I wore it with jeans so the phone could slip into my pocket, and the pack was able to hold a slim wallet with cash, credit card, ID my keys and a lip gloss. The pack actually worked really well as a belt for the jeans, but you do spend some extra time re-tucking the leather strap in and around. Very cute waist pack! The Cutest Fanny Pack Ever! This update to date fanny pack is absolutely the cutest. You can only put your phone or slim case wallet in it (not very big). Definitely a unique way to jazz up your outfit. I couldn't even fit my phone in here! It's mostly because of the shape. Such a cute bag though! 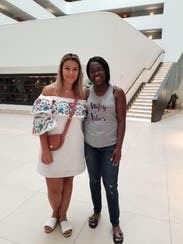 Super cute and I got a lot of compliments but the strap being so long made it hard to figure out how you are supposed to buckle it!